If you have not been to Longevity lately, you might want to stop on by. We have added 5 new wines to the menu! First up are our Spring Whites. We have released both our 2018 Pinot Blanc, and our 2018 "Pink" Pinot Grigio. Next up is our 2016 Classic Merlot, followed by the 2013 Vintner Select Barbera, and last but not lease, the 2016 Vintner Select PressTon! Lots to taste at Longevity, and most likely South Smokin' BBQ will be out front to cure the munchies! Join us for the Second Annual Wine & Wags event, Sunday June 2nd, from noon to 4:30PM! Livermore Valley's dog friendly wineries host a day of fun for dogs and owners across the region. the Wine & Wags Event, $30.00 online at lvwine.org, or $35.00 the day of the event. We will definitely be pouring PressTon as one of the pours for ticket holders! choosing Longevity as one of your road trip destinations. Allison’s show, “Epicurean Diva” airs every Sunday at 12:00 Noon on KRON 4. Cheers! Hop on and Experience Livermore Valley Wineries!! Livermore Wine Trolley is the newest way to explore and experience wineries located in the Livermore Valley. Come and try our all-inclusive wine tour using the Trolley for your group’s own private charter. You will be surrounded by lush rolling hills, picturesque canyons, and award-winning wineries. Click here to hop on! 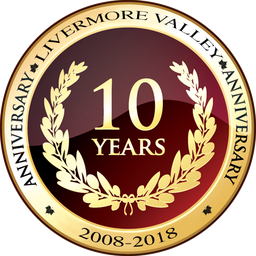 The Livermore Valley iPhone & Android app concentrates on the Livermore area wineries, along with a sampling of local businesses and events for the user. It provide the highlights for wine lovers spending a day or weekend in Livermore to stay busy. Click here to download.